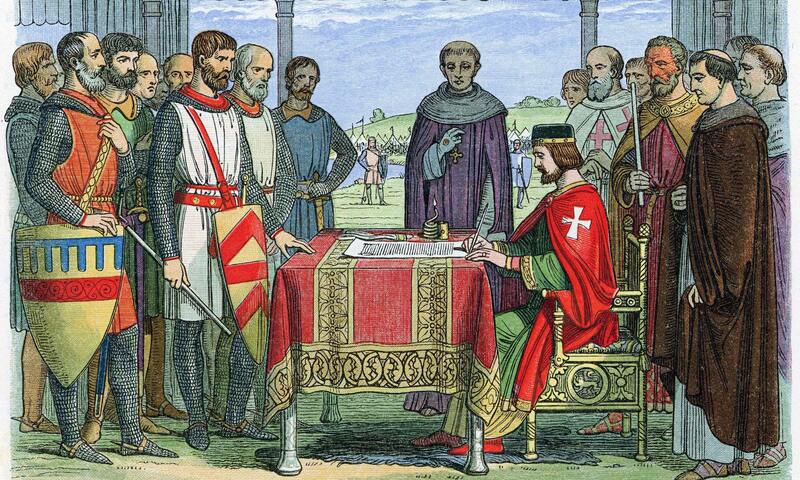 Without the Magna Carta signed at Runnymede on June 15th, 1215 there would probably be no American Constitution and self government as we know it today may have been impossible to obtain. 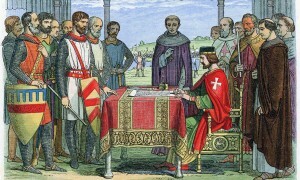 Driven to rebellion by abuses of royal taxation power, nobles imposed the Magna Carta (“Great Charter” in Latin) upon England’s King John at Runnymede on the Thames on June 15, 1215. The name merely reflects the document’s length, not any contemporary understanding that Magna Carta would become the “greatest constitutional document of all time,” as described by Britain’s most renowned jurist, Lord Denning. “Most of its clauses deal with specific, and often long-standing, grievances rather than with general principles of law,” the British Library notes. “Some of the grievances are clear; others can be understood only in the context of the feudal society in which they arose. The precise meaning of a few clauses is still uncertain.” Certain Magna Carta articles, for example, regulate borrowing from Jews, reflecting the money-lending role this people played in a medieval society that forbade Christians from earning interest. “Perhaps the most radical clause in Magna Carta was the 61st,” the British Library concludes, establishing a 25-baron elected commission to monitor and enforce royal settlement compliance with powers of property seizure. The Soviet Union’s law proclaimed rights, Hannan notes, but, “as Soviet citizens learned, paper rights are worthless in the absence of mechanisms to hold rulers to account.” Magna Carta’s inauguration of conciliar rule developed directly into Westminster’s Parliament; the “whole constitutional history of England is little more than a commentary on Magna Carta,” wrote noted Victorian British historian William Stubbs. While modern democracies often debate the role of religion, linkages between faith and freedom are quite prominent in Magna Carta. Its preamble opens in the name of the “health of our soul and those of our ancestors and heirs, to the honour of God, the exaltation of the holy Church, and the better ordering of our kingdom.” Like the United States Constitution’s First Amendment, Magna Carta’s first article concerned ecclesiastical freedom and “confirmed for us and our heirs in perpetuity, that the English Church shall be free, and shall have its rights undiminished, and its liberties unimpaired.” This article reflected King John’s struggles with Pope Innocent III over the appointment of the Archbishop of Canterbury; faith’s defense before state power is no new issue. The Declaration marked how Magna Carta, as Churchill noted, was to become the “foundation of principles and systems of government of which neither King John nor his nobles dreamed.” “We hold these truths to be self-evident, that all men are created equal, that they are endowed by their Creator with certain unalienable Rights,” the brilliant colonial Thomas Jefferson wrote in 1776. From even more humble origins, President Abraham Lincoln referenced in his Civil War Gettysburg Address the Declaration’s dedication to a “new nation, conceived in liberty and dedicated to the proposition that all men are created equal.” Standing before the Lincoln Memorial, Rev. Martin Luther King in his 1963 “I Have a Dream” speech called upon the United States to redeem for African-Americans the Declaration’s “promissory note to which every American was to fall heir.” From Magna Carta’s mustard seed has grown a mighty tree of liberty.